The SensorART platform will be an open, interoperable, extendable and VAD-independent platform which will incorporate different hardware and software components in order to improve both the quality of the patients’ treatment and the workflow of the specialists. Sensor Module: It will be used to monitor both the VAD’s and the patient’s status. During the project, a set of sensors will be appointed and used. After the clinical trials, this set will be refined, aiming to recognize and define “disease specific” sensors. 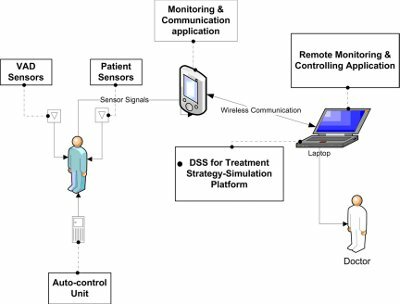 Signal Acquisition Module: A software component, which will collect all signals (the control unit described above will not assess the signals of all the sensors) coming from the sensors and present them, in a formal and easy-to-access way, to the patients. Monitoring tools will be incorporated to this component, providing both historical and real-time data representation. Moreover, the system will be designed under an open architecture; new sensors will be possible to easily be included in the SensorART platform, enhancing its extendibility. This component will be deployed in a small portable device, such as a PDA. Hardware Controller: A hardware unit, on which the auto-regulation algorithm of the VAD will be deployed. This unit, which will communicate wirelessly with the VAD, will be responsible to auto-adjust the provided blood flow of the VAD to the patient’s heart according to signals from certain sensors. Moreover, this unit will monitor the energy consumption, as well as the VAD functionality, generating the appropriate crucial and vital alert messages. In the framework of the project, a prototype of this unit will be constructed. Remote Control Framework: A software module, which will be deployed in the specialists’ personal computer and PDAs or Smartphones. This module will provide the capability of real-time remote-monitoring and controlling of the patient’s & VAD’s status. It will support wireless connectivity with the patient monitor unit and provide to the specialist monitoring, data analysis and data fusion functionalities. Thus, the specialist will instantly receive alert messages in order to make the appropriate actions. Decision Support System: It will assist the specialists on deciding the best treatment strategy for a specific patient. It will include a simulation component, which will give the specialists the possibility of modelling the behaviour of a patient before and after the VAD implant, as well as data analysis and projection tools. In fact, HF is primarily a disease of the elderly. Approximately 6% to 10% of people older than 65 years have HF, and approximately 80% of patients hospitalized with HF are more than 65 years old. HF is not a specific disease, but a constellation of signs and symptoms arising from different causes: post-hypertensive cardiomyopathy, primary myocardial disease, post-ischemic cardiomyopathy, valvular disease, abnormal ventricular filling and congenital heart disease. HF is the pathophysiologic state in which an abnormality of cardiac function is responsible for the failure of the heart to pump blood at a rate commensurate with the requirements of the metabolizing tissues and/or doing so using abnormally elevated diastolic volumes. It represents a major public health problem in industrialized nations. It appears to be the only common cardiovascular condition that is increasing in prevalence and incidence. In the United States, heart failure is responsible for almost 1 million hospital admissions and 40,000 deaths annually. Nearly 5 million patients in thiscountry have HF, and nearly 500,000 patients are diagnosed with HF for the first time each year. The disorder is the underlying reason for 12 to 15 million office visits and 6.5 million hospital days each year. During the last 10 years, the annual number of hospitalizations has increased from approximately 550,000 to nearly 900,000 for HF as a primary diagnosis and from 1.7 to 2.6 million for HF as a primary or secondary diagnosis. Nearly 300,000 patients die of HF as a primary or contributory cause each year, and the number of deaths has increased steadily despite advances in treatment. HF is the only cardiovascular disease that continues to increase in incidence and prevalence over the last decades. Its estimate prevalence is 1.1-2%, with an increased prevalence of 6-10% in people older than 65 years. From the Report of the Task Force of the American College of Cardiology and American Heart Association, HF results the major public health problem in the United States: in fact, nearly 5 million patients have HF, and more than 550,000 patients are diagnosed with HF for the first time each year. Nearly 300,000 patients die of HF as a primary or contributory cause each year, and the number of deaths has increased steadily despite advances in treatment. Values reported in Europe are similar with at least 10 million patients. Myocardial recovery after ventricular assist device (VAD) support has been reported in a prospective multicenter trial designed to assess the incidence of myocardial recovery in patients bridged to cardiac transplantation. Although cellular recovery and improvement in ventricular function are observed, the degree of clinical recovery is insufficient for device explanation in most patients with chronic heart failure. Nowadays different mechanical VADs are in use. Continuous-flow or pulsatile-flow left VAD can influence vascular pulsatility and input impedance, which might affect clinical outcomes.VADs are currently used as a bridge to heart transplantation and, more recently, as “destination therapy” due to the shortage of heart donors as well as the pathology increasing related to the aging society. There is experimental evidence that chronic unloading of the heart leads to reversed remodeling and improvement of the heart function. Some clinical experiences report as well the possibility to improve the cardiac function to the extent that the patient could be weaned from the device and a transplantation could be avoided. The underlying mechanism and the way to influence the reversed remodelling are however not well understood. In recent years there is important evidence that patients assisted by VADs can recover the natural heart functions and got out from the transplant waiting list. Also from an experimental point of view there’s evidence that VADs implanted on animal models allow to develop pressure and delivery capacity after a temporary assisted period with recovery evidence. Heart recovery mechanisms and related time are still unknown since today VADs are mainly implanted on patients in end stage heart failure with multiorgan failure. However, some patients with more chronic, advanced end-stage heart failure because of idiopathic dilated cardiomyopathy have been seen to show dramatic left ventricular size reduction during unloading with a left VAD (LVAD) with improvement or even restoration of cardiac function. The incidence of recovery, allowing LVAD explantation in patients affected by chronic cardiomyopathy, ranges from 18 to 72% according to the clinical experience reported in literature. when urgent transplantation is unfeasible. Moreover, there is evidence that patients have better quality of life following recovery as compared to heart transplantation and bridge-to-transplantation patients. Moreover, heart recovery merits to be studied even in younger patients in which LVAD allowed good functional recovery, but with low probability to be transplanted and high probability of long term assistance. reduce the cost in personnel to realize home support. Physical sensors could also allow to assess patient/LVAD hemodynamics relationship during assistance, in order to detect the contribution of the native heart. This issue may become important when the effect on recovery of drugs or other therapy (stem cells) has to be evaluated. Finally, monitoring native heart function during daily activity may give information about the effect of skeletal muscle endurance on myocardial recovery. Telemetric, wireless sensors (for physical and chemical variables) integrated in SensorART platform will allow the monitoring of patients after the LVAD implants. Patient evaluation can help in adjusting output of the assistance device, by considering the residual cardiac output of the natural heart and the need changes of the assisted patient (worsening phase and/or reacutisation phase, stabilized clinical state, normal life needs in chronic conditions). From a careful observation of Serious Adverse Events (SAE) or alterations of variables preceding the SAE, it could be possible to define new “disease specific” sensors, by considering a possible further implementation of the devices with specific chemical and/or biological sensors.